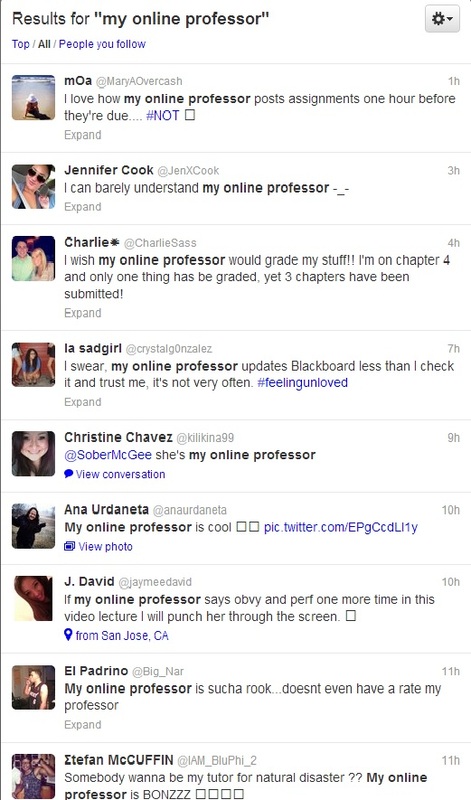 “…my online professor…” – Jonathan D. Becker, J.D., Ph.D.
One of the more interesting developments at the intersection of higher education and social media surfaced last week when Matt Thomas, a doctoral student at the University of Iowa, began sharing tweets that arose from a search of updates including the words “my professor.” Bill Rowan, an associate professor at Rowan University wrote a bit about that effort, and Lee Skallerup Bessette interviewed Thomas about what had transpired. 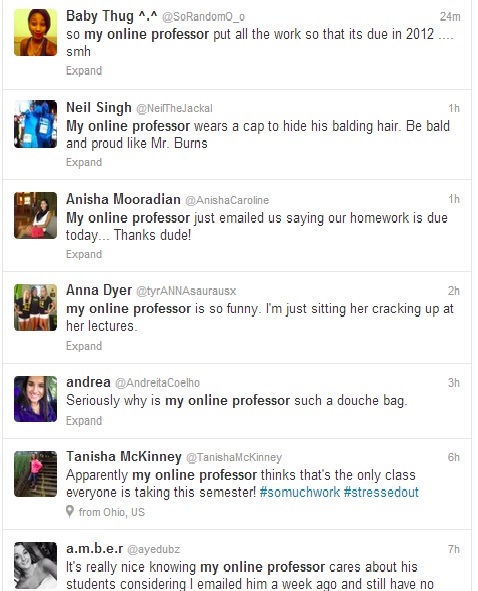 Both of those posts share additional links to folks who’ve written about the “my professor” tweets. I think Matt has done the professoriate a favor by giving them a curated glimpse into the increasingly non-private space they occupy. There are not that many tweets using “…my online professor…”, but this small sample does not paint a particularly flattering portrait. I will continue to monitor this and hope to post updates. I have also started looking at tweets using “…my online class…” and “…my online course.” There is more there, and, as a result, it’s a bit harder to parse. I’m looking for what students in online courses are saying that might be distinctive to the online format. For example, students complaining about the price of a textbook for an online course is probably universal to any course using a textbook. UPDATE (9/9/2013 – 8:25 p.m.): Here are the seven tweets that have surfaced in the 8+ hours since I first wrote the post.